It’s not that far-fetched, though. But what about using brain feedback to help make the movie? A trailblazing few firms and studios have delved into the upstart practice of “neurocinema,” the method of using neurofeedback to help moviemakers vet and refine film elements such as scripts, characters, plots, scenes, and effects. Princeton University psychology professor Uri Hasson coined the term “neurocinematics” based on an fMRI study, in which he concluded that certain types of films (e.g. horror, action, sci-fi) produced high activation scores in the amygdala region of viewer subjects’ brains, the part that controls disgust, anger, lust, and fear. Hasson asserted that horror filmmakers can potentially control audiences’ brains by precisely editing films to maximize amygdalic excitement and thus “control for” buzz and success at the theater. Independent filmmaker and neurocinema pioneer Peter Katz told Fast Company about the studios’ frustration with sketchy focus groups full of viewer respondents who “don’t really know or can’t articulate or even remember how they feel about a movie or scene.” On the other hand, Morgan Spurlock’s upcoming film, The Greatest Movie Ever Sold, makes fun of studios’ growing reliance on marketing, including trailer testing via fMRI brain scans, as a way to supposedly flop-proof films and bolster the odds of a blockbuster. The first time “Academy Awards” appeared in the same sentence with “neuromarketing” was probably a little over a year ago. The neuromarketing firm MindSign was so excited by Cameron’s reference they offered him “exhibition” (free) services including fMRI brain scans of subjects exposed to Avatar trailers (see below). 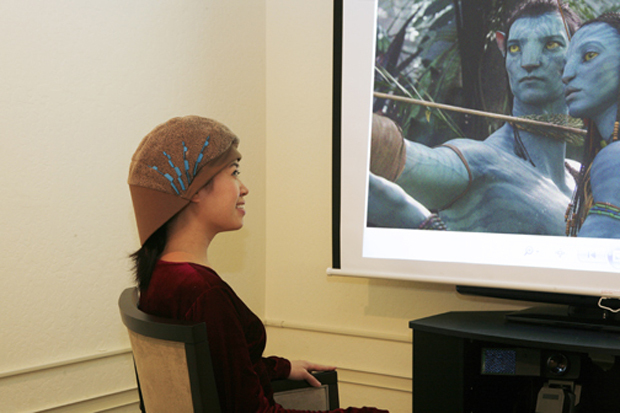 And Avatar, like many modern big-budget films, appears to have been strongly fortified by neuromarketing trailer testing, which uses EEG and biometric techniques to measure and record viewer brain responses to different trailer scenes and sequences. Unlike mainstream neuromarketing companies, MindSign has a niche focus on movies and trailer testing. Its founders used to work for Dreamworks and Sony and own one of the few fMRI machines used in the neuromarketing field. There is plenty of debate and rhetoric among competing firms about the best technologies for brain measurement. fMRI is considered reliable and brain in-depth but the machines are bulky, expensive, and preclude a real-world shopping context. NeuroFocus, which bills itself as the world leader in neuromarketing, employs EEG devices that are worn as headsets by viewers in the theater for movie and trailer screenings (see below). EmSense distributes a “lighter” version of these headsets to panels of respondents which results in a larger sample of test subjects. Still and all, neurocinema does not seem to be widely practiced by the major Hollywood studios. When Fast Company inquired for this story, marketing executives from five production companies behind films nominated in the Best Picture category declined comment or claimed no use or knowledge of neurocinema. 20th Century Fox, which distributed Avatar, declined to participate in this story. MindSign was reticent to reveal client names in our interview but did disclose they have been providing neurocinematic services to the Dowdle Brothers (Quarantine). The neuromarketing consultants and Hollywood filmmakers we did speak with also acknowledged that the studios are intensely competitive and notoriously tight-lipped, even about trailer marketing. Sands Research, which conducts neuromarketing studies on TV pilots and trailers, confirmed work on Paramount’s new Johnny Depp animated film Rango. “Often animation can be more engaging for the brain than real actors. Look at the strong response to Avatar,” says Steve Sands, the firm’s chief science officer. While he refused to discuss specific clients with Fast Company, NeuroFocus CEO A. K. Pradeep shared, “as a sneak peak,” some observations based on commercial neurocinema projects. They currently leverage neurocinematics for script vetting and character development, even cast selection. He’s animated in talking about the budding field as a film industry “game-changer” in the next few years. Pradeep works with leading studios in both the US and India and thinks Hollywood is chasing prolific Bollywood on neurocinema. (Susco believes tech-savvy Korea may also be ahead and more ripe for this approach). But just as with the neuromarketing of soup or cars, there are challenges to the effectiveness and acceptance of neurocinema. Neuroscientists cannot create ads or make movies. And the debate continues over conflicting technologies and standards, from Madison Avenue to Hollywood. The equipment and studies tend to be costly and can’t really replicate the real buyer and viewer world. 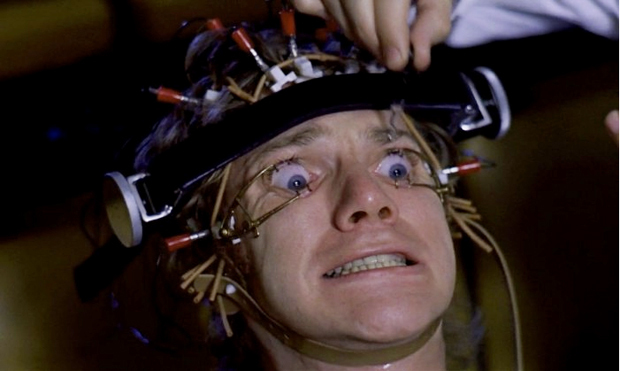 There is the predictable backlash from consumer advocates over “brandwashing” and mind control. In the case of Hollywood, many writers may feel that neurocinema is writing them out of the script (“I get hate mail from the writers,” says MindSign’s Carlsen). Neurocinema projects may in fact be more viable for some genres (action/adventure/sci-fi: Avatar) over others (drama: The King’s Speech). So while it’s highly unlikely on Sunday night that the Oscar-winning producer will thank a neuromarketer or will have employed neurocinematics (at least publicly) to make this year’s Best Picture, it does appear that neuromarketing is creeping further into movie-making. Pradeep’s vision that “brainbusters become blockbusters” may not be that far-off. 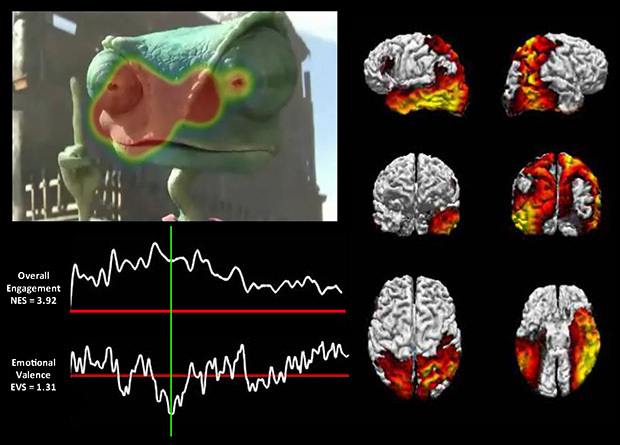 Brain scans of someone viewing the Rango trailer.